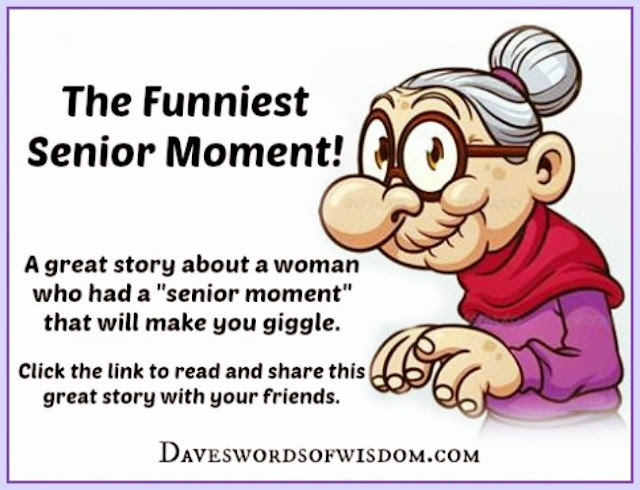 Daveswordsofwisdom.com: The Funniest Senior Moment. They got out and ran like mad. The lady, somewhat shaken, then proceeded to load her shopping bags into the back of the car and got into the driver’s seat. She was so shaken that she could not get her key into the ignition. two 12-packs of beer in the front seat. A few minutes later, she found her own car parked four or five spaces farther down. to the police station to report her mistake. If you're going to have a senior moment… make it memorable. It doesn’t matter how many times I see this I laugh it’s just so funny.